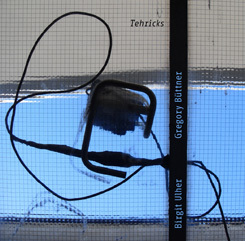 I will admit, that after giving it a few spins a week or so back it was Brian Olewnick’s little review of the Birgit Uhler / Gregory Büttner 3" CD called Tehricks on Gregory’s 1000Füssler label that encouraged me to dig this one out of the pile and play it some more. I’d quite enjoyed it on first listen, though I am a fan of the 3" format in general and tend to find myself gravitating towards music released on cute little discs (this one, being red and semi-transparent is particularly cute) more than most. However, reading Brian’s review I noticed something I had not spotted before as I had not paid any attention to the accompanying press release- Büttner, who works with a laptop played his sound contributions to this set of three short pieces through a series of tiny speakers placed inside Uhler’s trumpet and so used as mutes. This is a clever little idea, probably not original, though apart from Seymour Wright and Martin Küchen’s penchants for putting radios into the bell of their respective saxophones I can’t think of a recording example of this being done before. So, when I first played this through a few times, while it did occur to me that the sound of the two musicians was very nicely balanced I had no idea about the method used for creating the music. Listening back now though, with this additional knowledge I do think that the laptop sounds we hear have an acoustic edge to them, a resonance you would expect from being placed in such a vibrant position. Am I hearing things though? Does this new information really make me hear things I did not before? I listened carefully the first few times around so why did I not pick up on what I hear now on those occasions? If I was told that the duo recorded the music stood in an underground cave would I then hear different elements again? How much of what I hear is really there, and how much just a case of my brain tricking itself into what it wants to hear? I am very much interested in this area of thought, whether a certain kind of “applied” listening can reveal different things in a piece of music. I suspect here that I can indeed detect elements of the sound that result from the recording techniques that I didn’t pick up on directly beforehand, but then I also wonder how much I mentally amplify these elements above and beyond what there really is to hear. Anyway, Tehricks is nineteen minutes in total length and features a nicely balanced, not too gabby, not too spacious set of three improvisations recorded in early 2009 recorded in Uhler’s flat, which I am guessing is not situated in an underground cave. The laptop works through bits of processed field recordings and synthetic sounds, mostly shorter sounds or gradually changing textures. Uhler splutters little muscly noodles or trumpet around and through these, all squelchy splatters and spluttering pops and wheezes. The closing six minute piece Rix is my favourite, coving more of a dynamic and stylistic range than the other tracks, opening with a brief noisy streak of sound that I can’t easily attribute to either computer or trumpet and flowing off into percussive tapping, watery sounds and more than a little crackle and pop. Tehricks is a nice little disc, wrapped in an attractive little sleeve and one that would be pleasing enough on its own without the small revelations to be found in the press release, but this additional degree of mystery and uncertainty about what I can and cannot hear makes the listening experience that little bit more rewarding again. The label 1000füssler from Hamburg produces high quality releases of electronical and electro-acoustic music. For this release Birgit Ulher and Gregory Büttner did a collaboration project. The sounds are recorded at the flat of Birgit Ulher. Birgit Ulher plays trumpet, mostly in free-improvisation and experimental music. Gregory Büttner makes soundart and electroacoustic music and runs the label 1000füssler. Both live and work in Hamburg-Germany. "Gregory Büttner plays sounds from a computer through various small speakers, which Birgit Ulher uses as mutes for her trumpet. This way the trumpet sounds and the electroacoustic sounds are modulated by the acoustic resonance chamber of the trumpet. The trumpet is simultaneously a transmitter and a receiver." The combination of the acoustic sound of the trumpet, air and blowing with the electronic sounds of the computer works well. The first track "Tehr" has a warm character because of the sound of breathing. "Eri" starts slowly and quiet, but has more high tones which makes the listening to the music difficult. Sometimes it is paining my head. The third track "Rix" starts noisy, is more experimental by variation and using different sounds of the trumpet and computer. "Techricks" is not an easy album to listen. At a small volume it is more ambient and some details are a small layer in the music. When you play it loud, all soundsources are more obvious and a lot of is to discover in this release. Nice experimental work! Schon die nüchterne Beschreibung der Aufnahmesituation wirkt sympathisch: Recorded January 2009 at Birgit’s flat. Und zwar so: Büttner produzierte kleinste blubbernd-sprutzelnde Tonkleckse auf seinem Rechner und spielte diese durch kleine Lautsprecher ab. Die Lautsprecher steckte Birgit Ulher als Dämpfer in ihre Trompete, die sie dann spielte. So entsteht im Trompetenhals in der Begegnung von genuinen Instrumentalsounds und dem Abspielen von vorstrukturierten elektronischen Sounds gewissermaßen im Windkanal eine eigentümlich bizarre Klangwelt, die von gescheiterter Sprachlichkeit handeln mag. Gurgelndes Zischen, dass einem Marsmännlein in der Kehle stecken bleibt. Trompete und Electronics, aber auf besondere Art verbunden. Büttner beschickt kleine Lautsprecher mit Computersounds. Ulher benutzt die Lautsprecherchen als Dämpfer, so dass die Klänge in der Resonanzkammer des Trompetentrichters moduliert werden. Die Trompete ist so gleichzeitig Empfänger und Sender. Hab ich das richtig verstanden? Jedenfalls haben wir es mit einem Fall von EAI zu tun, geräuschnaher Improvisation, wie sie schon etwas länger als mir lieb in Mode ist, mit einem geradezu symbiotischen Verhältnis von Elektronik und Akustik. Grollende, schmauchende, klickende, tuckernde, pfeifende Geräusche verwischen, verschleifen, überspielen die Differenziert- und Begrenztheit von Luft, Metall, Spucke, von vorwärts und rückwärts, von fest, flüssig, luftig und elektronisch. Der immer wieder heftige, nahezu stimmhafte Track ‚Rix‘ überzeugt besonders schön in seiner geräuschverliebten, spielverliebten, xenophilen Dramatik. Birgit Ulher spelar trumpet på ett alldeles särskilt vis. Jag hör hennes läppar, beröringen känns, luften väser varm. Det är som om hon med största iver samtidigt befann sig både inne i och utanpå sitt instrument. Instrumentet är också som en hunds nos som undersöker den närmsta omgivningen. Här skapar Gregory Büttner små diskreta knackljud, fräsiga elektroniska påminnelser om vakenheten, som om vår trumpetare gått in i trance, vilse i instrumentet. Det är en spännande och förtätad duoskiva på endast en liten tretums-CD, som berättar hur hisnande långt man kan nå med den korta dikten eller täta novellen. Det är musik som mer liknar en buljongtärning än en middagsbjudning. Hela det klangliga register Ulher uppvisar på de ovanstående duoskivorna manifesterades redan på den viktiga soloskivan ”Radio silence no more” som spelades in för fyra år sedan. De klangliga strecken dras upp, punkterna markeras, det susar, viner, bluppar och bubblar. Till och med ett muterat spräcksolo träder fram. Det är en mycket formstark musik hon spelar, flyktig javisst, men mycket tydlig. När hon spelar solo kan hon också arbeta mer med tystnad, eller pauser om man så vill. Här bryter de av, lyfter fram det spelade, förtydligar. En avgörande skiva i Birgit Ulhers utveckling, men också en betydande skiva för trumpetens breddade klangvärld.